Home / 2018 / November / 12 / Critical Theory and Interaction Design (MIT Press) is Available! 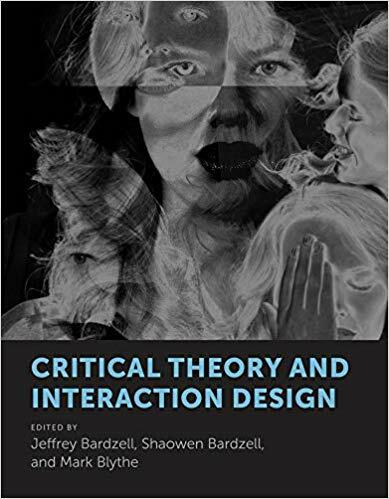 I’m so excited to share that my new book, co-edited with Shaowen Bardzell and Mark Blythe and entitled Critical Theory and Interaction Design, is now available. After discussing the need for such a book for years, we finally moved forward when we came upon a cool concept for it: we’d invite leading HCI researchers to identify a single reading from critical theory (broadly construed–very, very broadly construed) and write a commentary on its potential uptakes for HCI and design. Then, we would include the source reading as well as the commentary. The final version has twenty such pairings (40 total chapters, adding up to nearly 900 pages), plus a substantive introduction from the three of us co-editors. Why should interaction designers read critical theory? Critical theory is proving unexpectedly relevant to media and technology studies. The editors of this volume argue that reading critical theory—understood in the broadest sense, including but not limited to the Frankfurt School—can help designers do what they want to do; can teach wisdom itself; can provoke; and can introduce new ways of seeing. They illustrate their argument by presenting classic texts by thinkers in critical theory from Althusser to Žižek alongside essays in which leaders in interaction design and HCI describe the influence of the text on their work. For example, one contributor considers the relevance Umberto Eco’s “Openness, Information, Communication” to digital content; another reads Walter Benjamin’s “The Author as Producer” in terms of interface designers; and another reflects on the implications of Judith Butler’s Gender Trouble for interaction design. The editors offer a substantive introduction that traces the various strands of critical theory.